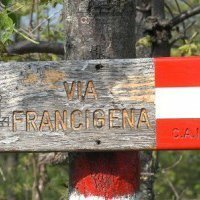 The Via Francigena is the ancient road and pilgrim route that in medieval times linked Canterbury to Rome, and has been rediscovered by modern walkers who set off on along an extraordinary path filled with artistic and historic treasures. The long and varied route passes through Tuscany and touches some of the most beautiful and characteristic places of the region. The Tuscan part of the route goes from the Cisa Pass and after 15 more legs arrives in Acquapendente, a town in the most northerly part of the Lazio region. The itinerary can be undertaken one leg at a time or by selecting the parts that are of most interest. The first leg of the Via Francigena in Tuscany goes from the Cisa Pass and is 19.4 km long, taking about 5 hours. After about 1km along the Cisa Pass you follow paths leading to the Righetto pass, where there is a steep descent which takes you to Groppoli. The route continues through the typical villages of Groppodalosio, Casalina and Topelecca, then rises again at the Crocetta pass (700m altitude). From here, the path leads down again to Arzengio and in a short while you come to Pontremoli, a typical medieval town rich in history and traditions. Crossing its medieval bridges or walking along its paved roads is like stepping into a book of art history. The second leg, 33 km long that takes around 8 hours, crosses unpaved roads and dirt tracks with long stretches in the woods. From Pontremoli you continue to the ancient village of Filattiera, whose territory offers much historic evidence ranging from the remains of defensive structures to places offering pilgrims shelter. One outstanding structure is the Pieve di Sorano, an important place of worship that was built using pebbles from the river. Continuing along the valley of the Monia torrent you reach the walled village of Filetto, where you can find the 15th Century Palazzo dei Marchesi Ariberti before arriving at Villafranca. Once you have crossed the Bagnone stream, you encounter Terrarossa which is dominated by the Malaspina castle, before arriving at the end of this leg: The Abbey of Saint Caprasio in Aulla. At 32.4 km long, the third leg can be divided into two parts: the first part takes you along the beautiful but challenging path where you will catch your first glimpse of the sea and the second part leads over more level land. On this stretch you will encounter: the 17th Century Sanctuary of the Madonna of the snow at "Il Gaggio" in Podenzana; the Malaspina Castle at Fosdinovo; the ruins of the Brina Castle in Sarzana; The archeological area in Luni, with its ancient Roman gate where marble passed through as it was transported to Rome; and the Church of Saint Peter in Avenza, which preserves a wooden crucifix thought to have miraculous properties. The fourth leg departs from the Castruccio Tower in Avenza and is 27.8 km long, taking about 6 hours. After Avenza you take the route surrounded by vineyards that cover the hills, where you can enjoy stunning panoramas of the Apuan Alps and the sea. You then pass through the centre of Massa, where a visit to the Diocesan Museum and the Cathedral dedicated to Saints Peter & Francis is a must. Following this, there is a short climb to the town of Montignoso, where you encounter the Aghinolfi Castle, a structure of historic value that is possibly one of the oldest castles in central Italy. From here you take another panoramic pathway until you reach Pietrasanta, a wonderful artistic city that is home to sculptures and marble from the Apuan alps, and is famous for its sizeable community of artists from all over the world who have made their home there. After visiting Pietrasanta, which has also been called “little Athens” on account of its rich cultural and artistic heritage, the Via Francigena continues towards Lucca. Straight after Pietrasanta you come to Valdicastello, noted for its ancient Pieve di San Giovanni e Santa Felicita, one of the most important examples of Roman architecture in the Lucca area. The next part of this leg takes you to a visit of the historical centre of Camaiore and its ancient abbey, then on towards Mount Magno, home to the ancient inn of Saint Michael, and through the Freddana Valley, arriving at Valpromaro. From here you descend into the valley of the Contesola stream and crossing the Serchio river, you shortly arrive in Lucca, where you’ll enter from the ancient gate of San Donato. The first destination of the pilgrims who entered Lucca was the famous wooden crucifix "Volto Santo" conserved in the Cathedral of San Martino. At just over 17 km in length, the sixth leg links Lucca to Altopascio, a small town known as the “city of bread" because it has maintained the ancient tradition of grain production throughout the centuries. Leaving Lucca from the gate of San Gervasio you then reach Capannori with its forty communities, each with their own characteristics that make them unique. One such place is Frizzone, with its 6th Century BC Etruscan steel route, the oldest cobblestoned street in Europe. The next destination on the route is Porcari, a village dominated by the imposing white marble church dedicated to San Giusto, with its grandiose bell tower. You then arrive at Badia di Pozzeveri and shortly after at the Church of San Jacopo in Altopascio. After Altopascio you continue in the direction of Galleno, where Philip Augustus of France passed through on his way back from the third Crusade (1191). Once past the hills of the Cerbaie you go towards Ponte a Cappiano, which takes its name from the Medici bridge and the hill of Cappiano, found above the bridge. The trail takes us across marshland to the centre of Fucecchio then, once over the Arno river you come to San Miniato, a delightful medieval town that is still perfectly preserved. One of San Miniato’s symbols is the Citadel of Frederic II, constructed between at the highest point of the town between 1217 and 1221 at the request of the Emperor. The eighth leg, 23.7 km long taking around 6 hours, starts from San Minitato and after a short walk you will discover a trail of extraordinary beauty along the hilly ridges of the Val d'Elsa, studded with castles, citadels, inns and abbey structures that originated with the pilgrims’ passage along the Via Francigena. Along the route you will come across two structures: The Pieve di Coiano; and the Pieve di Santa Maria a Chianni, one of the most important monuments of the Roman constructions of the area. This leg of the tour ends at the Cristo Re Church in Gambassi. This leg is quite short at 13 km (just over 3 hours), but is characterized by the pretty ridges of the Val d'Elsa. Along the route you can see: The Sanctuary of Maria Santissima Madre della Divina Provvidenza in Pancole, which safeguards valuable works of art; and the Pieve di Santa Maria Assunta in Cellole. This leg concludes in San Gimignano, a beautiful small walled medieval hill town and UNESCO World Heritage Site. The picturesque town is famed for its numerous towers and for Vernaccia, a white wine that is produced exclusively from the vineyards of the surrounding territory. The tenth leg, one of the most beautiful of the Via Francigena, is 29.8 km long and can be completed in 7 hours. From San Gimignano you follow an uphill pathway that leads to The Abbey of Santa Maria Assunta in Coneo, which dates back to the 12th Century and has maintained intact distinctive features of the Roman period, possibly thanks to its isolated position. Crossing the bridge over the river Elsa you come to the Roman Church of San Martino di Strove, a small 5th Century building that still today maintains its original Roman structure of a single nave with apse. This path then goes in the direction of Abbadia a Isola, where the Abbey of Saints Salvatore & Cirino with its valuable frescoes can be admired. The final part of this leg takes you to Monteriggioni, one of the most well-known and best kept Italian walled towns. Mentioned in Dante’s Divine Comedy, Monteriggioni offers visitors a real slice of history. After Monteriggioni, you continue along the white roads of the hills surrounding Siena towards the ancient medieval town of Cerbaia. Here you can visit the Castles of Chiocciola and Villa, two small closely placed castles set in wonderfully green surroundings. After crossing the Renai woods you arrive at Porta Camollia, one of the oldest gates of Siena. In the city you take via Banchi di Sopra taking you to the end of the leg where you discover Piazza del Campo, world renowned for its architectural beauty and of course the yearly inter district horse race “Palio di Siena”. Here there is also the Museum Complex of Santa Maria della Scala, once one of Europe’s largest hospitals, within which almost all the great Sienese artists have contributed important works. From Siena you head towards Grancia di Cuna, whose imposing red brick bulk is one of the best preserved examples of a fortified medieval farm, as well as being one of the most original architectural complexes in the province of Siena. The route takes you on to Quinciano, where you can see the remains of the Church of Saint Albans. Not far away, you will encounter the fortified village of Lucignano d'Arbia, whose origins can be seen in the two 12th Century gate towers and the medieval tower transformed into a bell tower of the Roman church of San Giovanni Battista. After a stretch running parallel to the railway lines, this leg concludes in Ponte d'Arbia. From Ponte d'Arbia you then arrive in the enchanting medieval hamlet of Buonconvento. Buonconvento is one of the most fascinating hamlets of Tuscany thanks to its 12th Century city walls, its ancient buildings, and the gates of Porta Senese and Porta Romana. After climbing up the Valley of Ombrone you undertake a stretch of the Cassia road towards Montalcino, where the Brunello vineyards blanket the hills. This route takes you to Torrenieri, where there is the Church of Santa Maria Maddalena, mentioned by Sigeric of Canterbury. From here you can immerse yourself in the breathtaking scenery of the Val d'Orcia and this leg comes to an end at the magnificent Collegiate of Saints Quirico & Giulitta di San Quirico d'Orcia, a fascinating church dating back to the 8th Century, though the current structure is from 12th -13th Century. This stretch of the route is rather challenging: 32.7 km that take approximately 7 hours, with many ups and downs on the barren hills. Setting out from San Quirico d'Orcia you first encounter the fortified hamlet of Vignoni, with its extraordinary panorama over the Val d'Orcia. As you descend, you reach Bagno Vignoni, a lovely little medieval village famed for its thermal springs (there are many Spas and wellness centres in this area). In the centre of the town you can find the "Piazza delle sorgenti", a large thermal tank which contains the original source of water from subterranean volcanic origins. After a long walk of ups and downs the path leads to the old inn called Le Briccole, from where there is a steep climb towards the end of this leg in Radicofani. The last leg, of 31.8 km in length taking 7 hours, commences with an 8km descent along the ridge that offers a breathtaking view over the valleys that stretch towards the Lazio region. Once at Ponte a Rigo, there are a few more kms to walk before you reach the confines of the region of Lazio. When you arrive at Proceno, you go down to Ponte Gregoriano, before taking on the last steep climb towards the Church of Santo Sepolcro, where this leg concludes in the town of Acquapendente..
For further information you can visit: Regione Toscana.